I finally read my first Tolstoy. 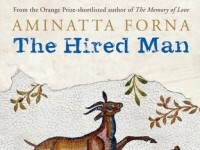 I’ve always been afraid of picking him up because, well, the Russians are just so daunting but, since I’m trying to read some of the books from the 1001 Books to Read Before You Die list, I decided to bite the bullet. 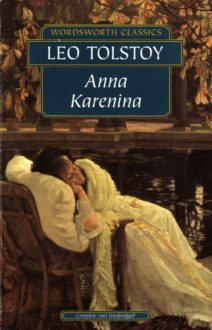 My first Tolstoy was Anna Karenina and I have a lot of thoughts, especially about the characters themselves. Because I figure that Anna Karenina is a book that someone either will read or definitely won’t read, this review will be a bit unconventional in that it’s not really a review. Instead, I’m going discuss my thoughts on each character individually, as well as my overall impression of the book. I’m also going to break my “no spoilers” rule because I figure the only people who will read this review to the end are people who have already read the book. In case you haven’t, though, be forewarned – everything else is a spoiler! The book might be called Anna Karenina but it’s not actually a book about Anna, rather it’s a book written around the idea of Anna. Sure, her love affair with Vronsky and her shunning of (and subsequently being shunned from) societal conventions is certainly a plot driver, but it’s her lingering presence that gives her staying power as a literary heroine. I found myself both loving and hating Anna – loving her for her bold decision to leave her husband to pursue love at a time that this was unheard of, but also hating her for being so selfish about it. The theatrics and drama was almost unbearable at times and I wanted to both applaud her and chastise her for being so overdramatic. Perhaps it’s because, deep down, I don’t really believe in love at first sight and so, therefore, her budding relationship with Vronsky was a conscious choice, and as a married woman I can’t comprehend it. Even though she goes crazy in the end, I pity her more than I empathize with her. She strikes me as someone who, even if she had lived, would have been perpetually unhappy and seeking reasons for to justify her state of mind. She’s a sad and tragic figure, but not because of her love story, but because her whole existence depends on darkness. I never liked him. Even before I knew that he was going to jilt Kitty and run off with Anna, I didn’t like him. I generally don’t trust characters with a lot of swagger and Vronsky was no different. Like I said before, I’m not a big believer in love at first sight, and so I see Vronsky as a selfish guy who went out of his way to seduce a married woman to make himself feel like a rock star, only to actually fall in love with her. I did have some sympathy for him, in the end, because Anna was so obviously insecure and becoming unhinged, but the fact that he was off meeting the woman she thought he was in love a with on that fateful train trip leaves me questioning any goodwill I felt towards him. I should probably have more sympathy for him because he gave up his career for Anna, but he made the conscious choice to do so and never seemed to regret it, so I don’t. I definitely feel for him more than I feel for Anna, but that’s honestly not saying much. I feel like I am supposed to hate Alexey for being so controlling and refusing to grant Anna a divorce, but mostly I just feel awful for him. Putting his political position and aspirations aside, he truly loved Anna and did everything he could to help her. Sure, he made some of those choices a little selfishly and he had his moments, but as a whole his actions were much kinder than they had to be. Not only did he give Anna permission to carry on her affair (so long as it was in secret), he initially wanted to remain married to her so that she wouldn’t be ruined. I don’t know that most men would care much about how their ex would be perceived by society if put in the same situation. Sadly, by the end of the book, Alexey was like a lost puppy dog and willing to let anyone be his master. With his career hitting a wall and his wife living with her lover, it seems to me that he became completely apathetic and unable to make any decisions on his own, hence his refusal to grant Anna a divorce based on the word of a clairvoyant. His desperate broken-heartedness is simply tragic and I feel more for him than I do Anna. Almost as soon as we meet Kitty, she becomes a character that we pity and begin rooting for. After being bewitched and subsequently jilted by Vronsky, she passed up Levin, who was hopelessly in love with her. When she realized her mistake, she fell into a deep depression and began to question everything she thought she knew. I enjoyed Kitty’s development over time as she became more sure of herself, pulled herself out of her Vronsky funk, and married Levin. I really liked Levin in the beginning. He was aloof, good natured, and had a childlike wonder to him that made him an instant favorite. After Kitty’s rejection of him, I planted myself firmly in the pro-Levin camp. Unfortunately, the qualities that endeared me to him in the beginning had me annoyed with him in the end, and his aloofness and childishness was just too much for me. As much as I tried to recapture that first feeling of love for him, I couldn’t, and even his “redemption” at the end couldn’t squash my indifference towards him. I admit, the amount of which my feelings for Levin changed over the course of the book is a major contributing factor to how much I equally love and hate this book because I really, really wanted to keep liking him. I don’t have too much to say about Dolly other than I just felt so bad for her. Her husband was cheating on her and yet she stayed, only to regret it later. She seemed to me like a good, honest woman who tried to do the best for everyone around her and was taken for granted and I wish she had a happier existence.